Are you looking for an app that can help you organize your trip? Trip38 is a travel manager that helps organize travel documents and manage itineraries. It also helps locate airport services, taxis, wireless internet hot-spots (wifi) and allows exploring your choices at destination including options for dining and on going events and attractions. This app is unique because, it focuses on post booking travel management. Those who travel frequently, especially official or business trip will know how stressful it is, as they need to organize the trip and keep track of various deadlines during the trip. The creators of Trip38 claims that the app is agnostic to any destination, airport, airline, hotel services which means the app will not give any preferences to particular hotel or flight company. There are many apps I've used that can be useful to book your flight ticket or hotel booking. But, apart from that these apps are not really helpful in managing itineraries of travelers especially the businessmen and professionals. Trip38 app is easy to install, uses little resources and the user interface is intuitive. I tried the search functions for available flights to Mumbai from Cochin and it displayed the flight details reliably. I manually added flight information and the app showed all other information including check-in time, flight terminal and other airport services. It also displays tourist destinations near by as well. App displays real-time information which is quiet handy as sometimes flights are delayed or terminals are changed in busy airports. It also shows offers available inside airport shops. The app's user interface (UI) is simple, intuitive and fast as well. You can use the app using Facebook or signing up with Trip38. It also allows guest login. We can search for flights or hotels and can manually add our choices. Flight and stay information and other itineraries are available in one place. No need to take prints of flight tickets, hotel or taxi booking. 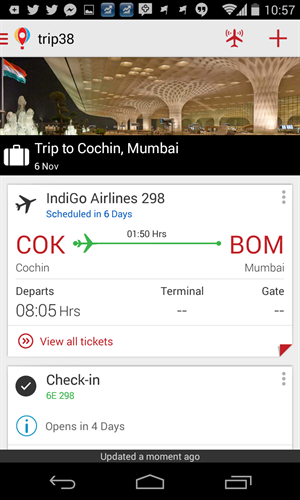 If flight and other booking information are send to explore@trip38.com, Trip38 can actually show mobile tickets. No need for paper tickets. It gives alerts on flight status, flight terminal for arrival and departure, baggage allowance information etc. Also shows duty free shops, dining options inside the airport, Wi-Fi zones, ATMs etc. 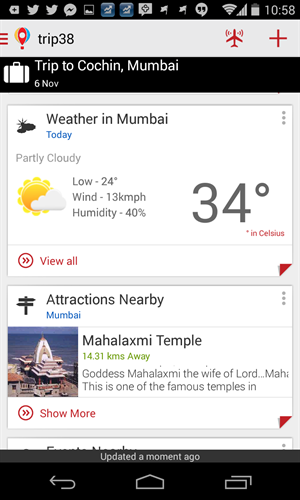 It shows Weather updates, Places of attraction near the destination, Restaurants and events near your location, Cab contact numbers, Embassy information, Emergency numbers. 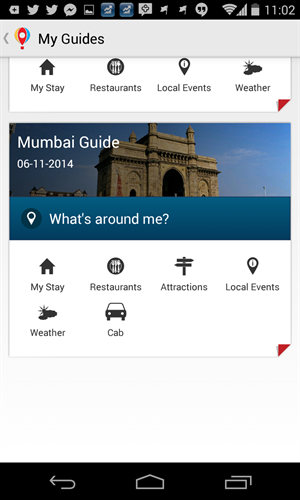 Trip38 can find nearby events and dining options using GPS. 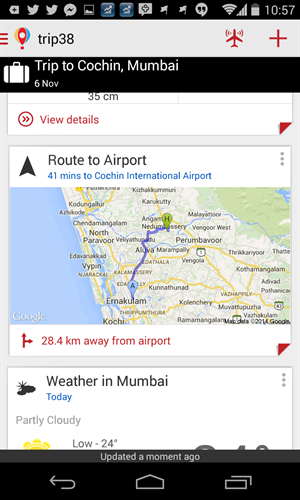 The app can also show Google maps route information from Airport to Hotel and vice versa. Trip38 have navigation support in Mumbai CSIA Airport terminal 2. One of the best feature of this app is, it can work offline. It is also lightweight as it is around 3MB in size when installed. Trip38 app is available for Android and iOS through Google Play and iTunes store. This app has the potential to add more features including support for other travelling options including Bus and Train. Since the app is focused on post-booking support, they can add Airplane model and seating arrangement and amenities available in the flight. 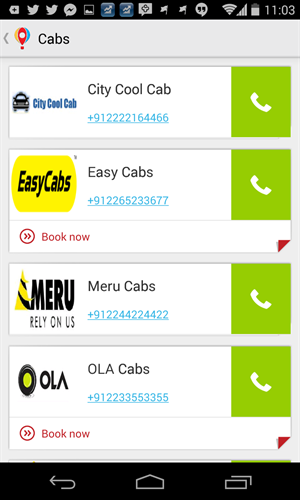 In the case of cab information, the vehicle details whether it is a Sedan car or a MUV which is available can be displayed apart from the phone numbers. Because, It can help travelers carrying big baggage particularly true with International passengers who will need a large MUV instead of a normal Sedan taxi. Overall, Trip38 is a useful application for those who travel frequently and needs a good travel manager that can really help in organizing the trips. There are many android and iOS apps that can ease the travellers with pre-booking and post-booking for railways, buses and such. Indian railways have IRCTC ticket booking app that is surely useful for frequent travellers. Great app, Although when I logged in and it kept crashing every time.